On my 25th birthday, I had a quarter-life crisis. I had lived for one quarter of a century and what did I have to show for it? No house, no husband, no car, no job and no money. What on earth had I done with all of that time? Of the 25 years that I have strolled this earth (or, perhaps more accurately, sat in a Starbucks drinking coffee, writing blogs, and laughing with friends), 20 of them have been spent in some sort of educational institution. Of course, the first 13 were not by choice, but the last 7 that I have spent in a post-secondary institution most certainly have been. This may come as no surprise to most of you, but I am an extrovert. I always sort of knew that I preferred being around people to not, but I received absolute confirmation when I worked alone in an office for 8 months. Without constant interaction with many different people, I became sullen and cranky and sad. But when someone would walk into my office and have a lively discussion with me, my mood brightened instantly. So it came as a bit of a shock to me when I learned that living with my friends is actually quite difficult for me. I've essentially lived alone for the past two years. In Vancouver I had three room mates in the fall, but we hardly ever saw each other, preferring to cook alone and spend time in our rooms. By January there were only two of us left in the apartment, each with our own bathrooms and operating on completely different schedules, so I, for all intents and purposes, lived on my own. Remember when this used to be a blog about books? Remember when I started a series about comedians's autobiographies? Well, I do (vaguely). 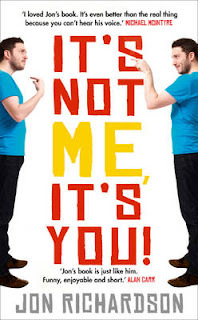 And I think I'll revisit that series today and write about Jon Richardson's bookIt's Not Me, It's You: Impossible Perfectionist Seeks Very Very Very Tidy Woman. A little bit of background for those who have never heard of Jon Richardson or are unfamiliar with his work and comedy style: Jon is one of the team captains on my favourite TV show 8 Out of 10 Cats, a British comedy panel show. Jon's "thing" (his "schtick," if you will) is that he's single and has been for quite some time (8 years as of August 2011), and that no other human could be perfect enough for him. It provokes laughs on comedy panel shows and in his stand-up routine, but reading 200-odd pages of it gets pretty old pretty quickly. Ottawa is the best. I've been here for a week now, so I think I can say that with complete certainty and authority on all things Capital. I have had a great first week in the city. Of course there have been hiccups - my first experience bussing to Carleton, for example, during which I took two wrong buses and got caught in rain without a rain jacket or umbrella - but overall I love it here. In fact, I was thinking yesterday morning as I rode the crowded bus to the O-Train (a la Vancouver's Skytrain) that already I feel like I'm settled in Ottawa.